[SatNews] In today's rapidly evolving pay-TV environment, content service providers have a need for speed when it comes to deploying and updating new services. Considering current market challenges facing pay-TV providers, the theme at the Viaccess-Orca IBC2015 stand (1.A51) is "fast or last, bon voyage!" 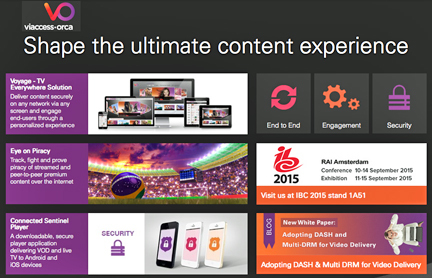 During the show, Viaccess-Orca will demonstrate how service providers can quickly address critical market changes to shape the ultimate content experience on every screen—ahead of the competition. Viaccess-Orca solutions guarantee that a service providers' voyage into the OTT multiscreen world is fast and seamless, ensuring maximum viewer engagement on a wide range of devices while protecting premium content. Voyage Console—TV Everywhere Management Suite: At IBC2015, Viaccess-Orca will showcase its new back-end management console for TV Everywhere, enabling service providers to manage multiple customers and device types (e.g., smartphone, Android™ tablet, iPad®, PC, TV with STB); content rights and offers (e.g., VOD, SVOD, live TV, nPVR, movie cards); and personalized content discovery through a single unified system that supports all delivery networks. The console allows operators' marketing teams to build service offerings in a few clicks as well as promote selected content in order to improve cost effectiveness. It also enables operators to engage with customers by sending messages to segmented groups of customers. For example, all accounts registered to a certain SVOD service can be notified about a newly added series. Through the console, operators can easily track problems such as failures in content preparation. The console uses advanced search and filter capabilities to pinpoint issues, while enabling operators to resolve problems quickly by performing bulk actions. Voyage Applications For Cross-Screen Engagement: Viaccess-Orca will show front-end applications, powered by Viaccess-Orca and Zenterio, on a variety of devices. The apps provide a superior service to end-users by offering a personalized and intuitive viewing experience for every screen. Leveraging the company's Voyage—TV Everywhere solution, Voyage apps enable seamless synchronization between devices. Through the apps, end users can easily interact with content, quickly switching between a second-screen device to the TV screen, in addition to viewing advertisements on second screens. &nbsp;&nbsp;&nbsp;Using the apps, service providers can effectively meet the expectations of today's end-users, saving them time and energy by personalizing the service and content offering to promote the most suitable content for each user. Real-World TV Everywhere Deployments With Telekom Romania and Olympusat: During a series of live demonstrations at IBC2015, Viaccess-Orca will highlight how Voyage saves precious time for operators, including Telekom Romania and Olympusat, while enabling them to provide an engaging experience for viewers. Using Voyage, Telekom Romania has deployed its new IPTV service and expanded into the OTT multiscreen world in a record time of just five months. Voyage enables Telekom Romania to support innovative features such as network PVR (nPVR), simplifying management of STBs and DVRs while making content available anytime, anywhere. Voyage is also powering Olympusat's new end-to-end OTT cloud-based service called VEMOX, which delivers Spanish content mainly in the United States and LATAM markets. VEMOX is a cloud-based OTT solution that quickly responds to market demands and challenges, while creating a secure, personalized, and consistent user experience. Adaptive Sentinel—Unified CAS Solution: Viaccess-Orca will unveil its Adaptive Sentinel solution, a unified, end-to-end card and card-less Conditional Access system that is secure, flexible, and cost-effective, enabling a quick time-to-market for pay-TV services. Adaptive Sentinel combines Viaccess-Orca's proven and widely deployed Prime Sentinel and Dynamic Sentinel solutions, offering service providers the highest standard of chipset and smartcard security alongside a rich set of card-less security and preventive services. With Adaptive Sentinel, operators no longer need to wait 6-12 months to deploy new STBs. Adaptive Sentinel makes it easy and fast to swap between card-based CAS and card-less CAS. Connected Sentinel Player: Viaccess-Orca will demonstrate how Italian operator Mediaset, Israeli satellite provider yes, and Norwegian operator TV2 were able to get TV Everywhere apps up and running within a matter of a few weeks with the Connected Sentinel Player. The downloadable, secure player protects VOD and live TV content on Android™ and iOS devices, enabling service providers to rapidly adhere to the security requirements of content owners. Connected Sentinel Player supports Microsoft® PlayReady®, approved by all major Hollywood studios, integrated with media playback technology by VisualOn's OnStream® MediaPlayer+. &nbsp;&nbsp;&nbsp;The Connected Sentinel Player offers a short time-to-market and is now available for a free trial, enabling operators to "try before they buy." Today's pay-TV operators have high expectations when it comes to fighting piracy, particularly on live sports broadcasting. Illegal content streaming links must be removed in a short amount of time after the beginning of the broadcast or rights owners' revenue streams will be impacted. At IBC2015, Viaccess-Orca will showcase its Eye on Piracy solution, which helps content owners and operators track, fight, and prove various types of piracy, such as Web streaming and peer-to-peer content redistribution, getting the links removed within the first few minutes of broadcast. &nbsp;&nbsp;&nbsp;A new "Snapshots" feature has been added to the Eye on Piracy service to capture illegally redistributed video streams. This new capability enables rights owners to collect evidence on piracy, in real time, to build legal cases in the most efficient manner possible. During a live demo at IBC, attendees can see how the Eye on Piracy solution helps operators rapidly take down TV content from illegal sites and eliminate the redistribution of live events, such as major sports matches. David Leporini, the Executive Vice President of Marketing, Products and Security at Viaccess-Orca, will give a presentation at IBC2015 on the topic of piracy titled "A Close Look at the Architectures and Protocols Powering Illegal Content Streaming Over the Internet." During the presentation, Leporini will describe the methods employed to set up and scale ad-based illegal services using various protocols and streaming media platforms.